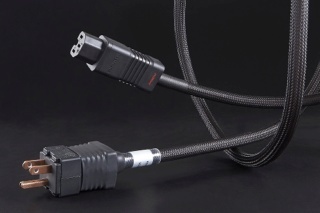 Picking up a Furutech power cord, from these supple, beautifully-made upgrade power cords for Home Theater, CD, DVD, Blu-ray, Projectors and Flat Screen Panels, the integrity of the cable’s build is immediately apparent. Furutech Pure Transmission quality turns a macro lens on every element of power transfer applying optimized engineering solutions to well-known problems such as contact resistance, EMI and RFI rejection, and using the best materials and processes available. The Odeon Power Cord delivers blacker blacks and more vivid colors and gives sound greater resolution, clarity, and dynamics in an ultra-quiet soundstage where the sound blooms seamlessly from top to bottom without artificial upper-frequency “presence region” glare. The new slimline IEC connector also allows for easy connection to space restricted IEC sockets that can be found on some high-end projectors and HD screens. • Floating Field Damper US Patent No. : 6,669,491/ European Patent (EP1445837) For FI-15ME(Cu) version only.